Gluten free. GMO free corn. Suitable for Vegetarians and Vegans. Recipe No.24 The Totopo* with smoky chipotle chilli & zingy lime with Red Bell Peppers, Guajillo chilli & Toasted Pumpkin Seeds *The tortilla image shown is a visual representation and not actual size. Recipe No.24 Totopo - meaning "to brown" in Mexican - is the Original name for tortilla chips. It was our 24th batch of totopo that made our Spirits sing and we knew we had hit upon a Mighty creation. The Deliciousness is all in the Detail. Shape: a tradition Triangle for a true Mexican Classic. Texture: finest White corn masa rolled out extra thin, Rested, toasted until it Pops, and then tumbled through sunflower oil for a Crisp base. Extra Crunch from "pepito" pumpkin seeds. 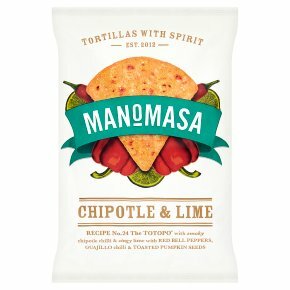 Taste: inspired by the Taqueria - first the heat from Guajillo chilli, then the sweetness of red Bell Peppers, next smoky depth of Chipotle chilli and finally a zing of Lime. Savour: crumble onto salads, serve with Ceviche, dip into Guacamole or, dare we suggest, enjoy with a sip of aged tequila?